Literally stuck ’em in a bucket. What a change! Over the ten year period of living in his home, this customer had watched more and more of his lawn die year after year with the hot summers. Enough was enough he decided, so in stepped Native Edge Landscape. This property went from a dwindling, water hogging lawn, to a property that has tastefully placed plantings and focal features. 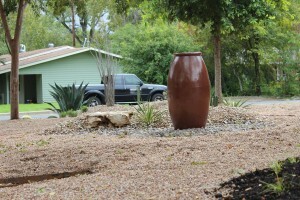 We had the challenge of creating an “all gravel” yard, without creating a stark and sterile aesthetic. We are pleased with our “Cacti Paradise” results!